Pedro Quina is a Filipino wushu athlete and a member of the Philippine Wushu Squad. A veteran of the sport, Quina has bagged numerous medals from various local and international competitions. He was a gold medalist in the Manila Southeast Asian Games in 2005, topping the nanquan (southern fist) tournament of the wushu competition. 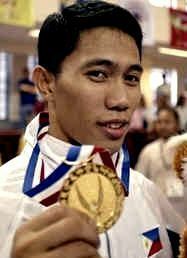 In May 2007, the Samar native also bagged first place at the nanquan tour of the National Wushu Championships held at the Ninoy Aquino Stadium. Recently, he and the Philippine Wushu Squad ruled the First Huangshan Wushu Taolu Championships held in Beijing, China from November 19 to 22, 2007. Quina finished first at the nanquan style while teammate Janice Hung fnished first at the taijiquan style. Artemio Montes have been competing and performing Wushu since he was just 14 years old. One of the original members of PaoHong Wushu, Coach Tem have won numerous National Wushu Championship Medals in Chang Quan, Jian shu (Straight Sword), Qiang shu (Spear) since 1999. He also practices Traditional Wushu routines and is knowledgeable in Lion and Dragon Dance Exhibitions.